Here on the Big Island of Hawaii, we live and work in paradise, with that comes its own challenges in the form of brush fires, land and sea rescues and a variety of rural and unique situations that we respond to. I’m grateful for all of my team members who keep the entire island safe, as we say from mauka to makai (the mountain to the ocean). 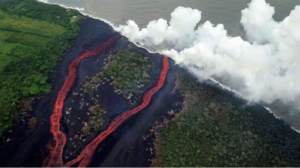 We are all personally invested and protect and provide services for 186,738 people who reside on the island .We are surrounded by water, and at the top of Mauna Kea we have snow, then just a few months ago worked tirelessly during the Kilauea lava eruption, and are ready at a moments notice if there is an impending tsunami. We also had a ballistic missile scare, which our team did what they do best, perform under pressure with limited resources. This is just the tip of the iceberg of the 9 other people I work with, who staff the only 911 Fire and EMS dispatch center on the island. I humbly ask for your vote, not for me, but for the 9 other people there who are dedicated to serving and protecting our beautiful island! Mahalo & have a wonderful day! !